As the sun slowly sinks in the horizon, Kampotheads and tourists alike find themselves drawn to the riverfront. Luckily, there is no shortage of sunset vantage points thanks to the sunset tours offered by a plethora of boats docked south of the Fish Market down to the Old Bridge. But how do you pick the sunset cruise that’s right for you? 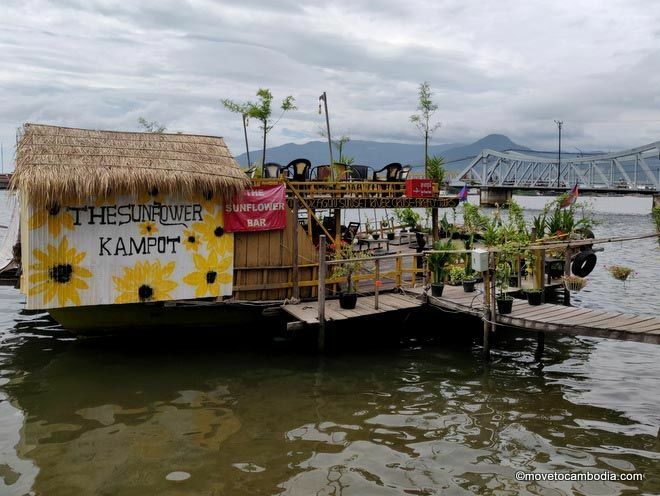 In this post I’ll give some suggestions on picking the right Kampot sunset boat cruise, plus some tips for getting the most out of it. 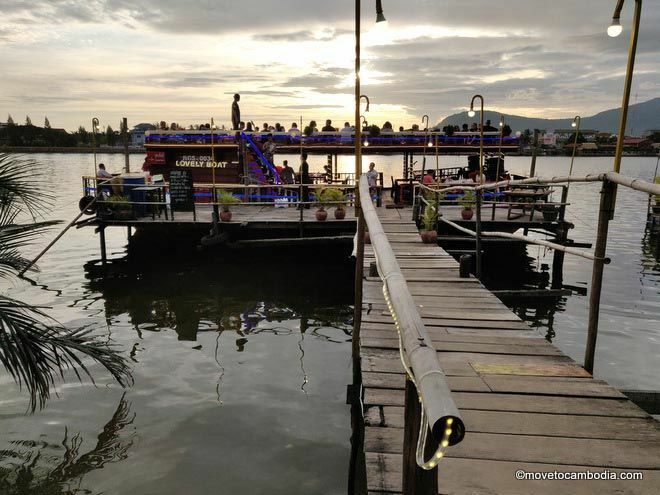 So you want to take a sunset boat cruise in Kampot? Each boat is staffed with friendly ticket sellers ready to point out the benefits waiting aboard. In the event you don’t see smiling faces seated next to the gangplank that piques your interest, there is sure to be a large board listing all the important information. 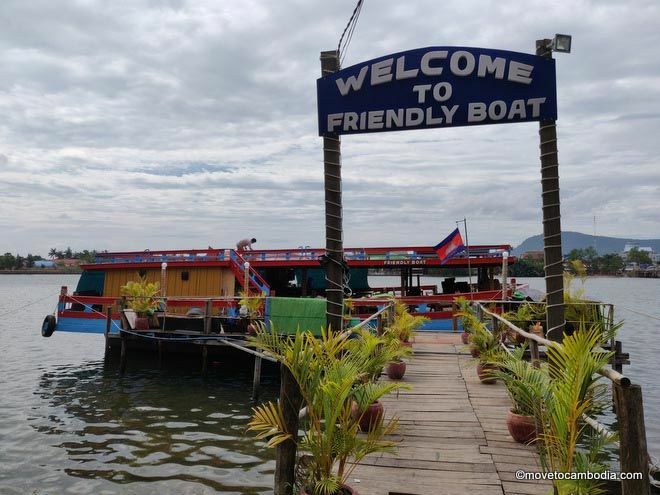 Not every boat on Kampot’s riverfront offers tours so keep a sharp eye out so you don’t miss out on a trip. Some boats stay docked and serve as a restaurant and bar for those of us who haven’t quite gotten comfortable in our sea legs. The Floating Garden is one such boat and their menu is displayed proudly on the sidewalk. If you don’t have time to go for a ride, Floating Garden is a great spot to watch the sunset and enjoy dinner or drinks. There are a dozen boat options for your Kampot river cruise (but they’re pretty much the same). Insect lovers will enjoy catching one of the firefly tours. Depending on the time of year, the firefly tours start leaving town at around 5 p.m. so be sure to hit the riverfront early if you want to have the full range of boats to choose from. Others leave around 5:30 p.m. Be sure to ask what is included in the ticket prices. As of this writing, most tours are charging $5 and offering two free beers or soft drinks per person, but in low season it often goes up to $7 with only one beer, so be sure to compare prices and see if anyone is willing to price match. The Lovely Boat seems to keep the same $5/two beer deal (which is undeniably good) all year round. When you ask about the price, have a look and see who is already on board. While most of the companies are offering essentially the same thing, the crowd on individual boats each night varies. If you’d prefer to be around others in your same age bracket, say, have a look and keep on moving if the crowd is not to your taste. Something to plan for on a boat tour is the chill factor. That’s right, even in tropical Cambodia you might sprout some goosebumps as you head up the river. A light jumper or wrap should do the trick in keeping you comfy. And those of you who seem to attract every mosquito within a 10 kilometer radius don’t need to worry as the mozzies are no match for your speed on the river. However, once the boat gets to the magical firefly spot, the buggers might come for you so be sure that any bug spray is applied before the tour starts! No one wants to be the person spraying DEET or citronella all over when people are trying to comfortably enjoy nature’s light show. There’s an intense rivalry between Friendly Boat and Lovely Boat. daily cruises, 5 to 5:30 p.m. 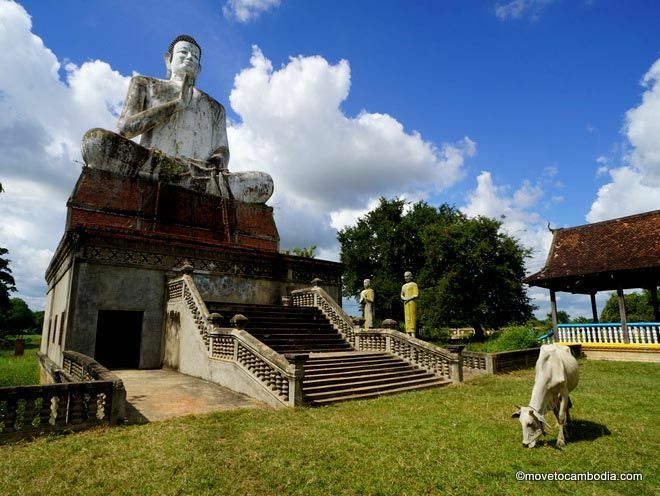 This entry was posted in Kampot and tagged riverside, boat trips, sunset cruises. Bookmark the permalink. 3 years ago we did not have all this.you could actually walk along the riverfront at sunset without all this drama. Poor Kampot. Heading the same way as all the other tourist traps. And 19 years ago it was nothing like 3 years ago. It is change, economic activity and putting food on a plate. Locals are living much better lives as a result. And left when it became unbearable. I experienced businessmen from all over India taking over Goa with ‘Crumbs’actually going to ‘locals’. Today their country has gone from Paridise to literally a cesspool run by forigeners with no regard for the Goans whos land ownership has fallen more than 60 %. Well water was drinkable 30 years ago , today the groundwater is filled with waste from poorly construced hotel cesspools that break up during the monsoons so now everyone must buy bottled water in plastic bottles which are EVERYWHERE. 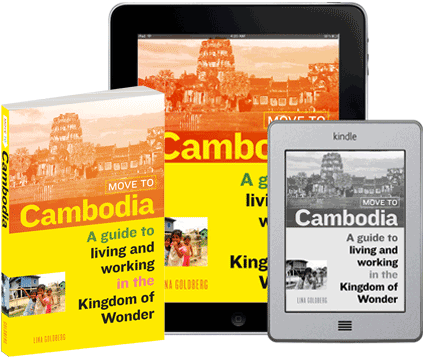 I read your comment about everyone having it better and know it’s only in the beginning until the Capitalists see little Kampot as a place for profits come what may and not a National Treasure.